The Cokin 40.5mm Circular Polarizer Filter helps to reduce reflections and glare by filtering out light that has become polarized due to reflection from a non-metallic surface. The light from the sun naturally becomes partially polarized due to reflecting off electrons in air molecules, causing the light to scatter into what appears as haze. A polarizing filter arranges, and filters, this directionally polarized light perpendicularly to the reflected light, allowing for the absorption of much of this light. This results in a noticeable reduction of glare and reflections from non-metallic surfaces and an increase in the saturation of skies and foliage. This filter is constructed from optical glass and features a black, or silver-colored, aluminum-alloy filter ring for durability while remaining lightweight. 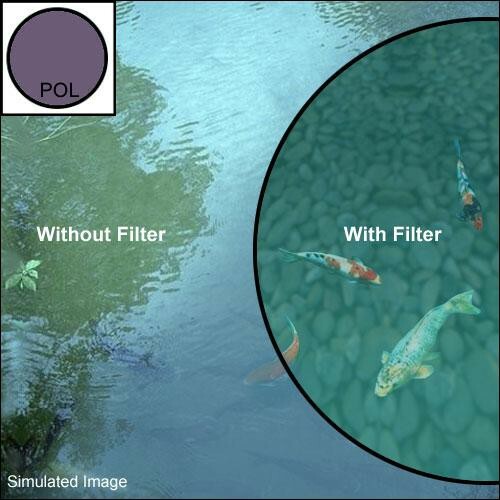 2 to 4x filter factor reduces exposure by 1 to 2 stops. Constructed from optical glass and a black, or silver-colored, aluminum-alloy filter ring. Box Dimensions (LxWxH) 4.095 x 3.071 x 0.63"
40.5mm Circular Polarizer Filter (Black or Silver) is rated 5.0 out of 5 by 1. Rated 5 out of 5 by docH from Neat little filter An odd size, but as usual B&H had it anyway. Well built frame with easy rotation. Will this work on a Sony a6000 ??? Sometimes these Circular types will not work on particular Digital Cameras !!! Thank You !!! This filter will work with any lens that has a 40.5mm diameter. Circular polarizers are compatible with digital cameras, however linear polarizers are not.